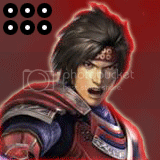 Sanada wrote: Can someone make a avatar and a sig about Yukimura Sanada? If I get a chance later on, I'll do an avatar for you. Not sure about the sig, that may take a while if I'm busy which tends to happen. This one is 160x160, so you won't be able to use it on this forum but perhaps elsewhere. This one however can be used on this forum. The major difference is the detail in appearance. Last edited by Sanada on Wed Apr 13, 2011 4:31 pm, edited 1 time in total. No problem, if I get the time I may be able to see what I can pull off for a sig. It reminds me of my Capcom BBS days... Well that and the fact that I happened to pop in a CD with a load of saved sigs last week i.e. Kenshin Himura, Sesshomaru, etc.